There are growing signs that the CCP has no intention of compromising with protesters in Hong Kong. There are growing signs that the Chinese Communist Party has no intention of compromising with Hong Kong protesters. Soon after the protests began in Hong Kong, the Pacific Realist took to these pages to argue that Occupy Central was doomed to fail. In that article, I argued that the CCP had already deemed completely free and fair elections in Hong Kong a threat to its existence, and the Party never compromised on its core interests. Mass protests wouldn’t change this assessment, and would instead likely harden Beijing’s resolve. 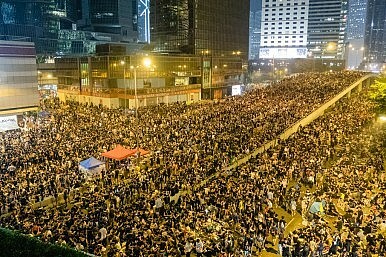 Specifically, it would signal across China that mass protests can force the Party to compromise on its core interests, a notion the CCP has always worked hard to suppress. “The Party giving in on a core issue because of mass protests would, without question, set a dangerous precedent for the CCP’s grip on power in mainland China. It therefore will not be done,” I wrote at the time. Nonetheless, I also noted that the CCP would do all it could to avoid using armed force to suppress the protests, but would in the end resort to violent suppressing the protesters before compromising on its bottom line. There is growing evidence to support this argument. Together these comments suggest that the CCP will not compromise on the core issues at stake in Hong Kong. By labeling the protests a color revolution, the CCP is suggesting that the U.S. is behind the protests, and is trying to overthrow the Hong Kong government to replace it with one that is friendly to American interests. This would in effect give the United States a strategic foothold on China’s doorstep, something that the CCP undoubtedly views as unacceptable. This is a consistent with a new report by Reuters which, citing “three sources with ties to the Chinese leadership,” says that Xi Jinping convened the new National Security Commission earlier this month to discuss the situation in Hong Kong. According to the report, at that meeting the top CCP leadership decided that offering any further concessions to the protesters would set a dangerous precedent that could reverberate in mainland China.